Iris Moon, a collage by artist Jennifer Murphy is a tribute to Georgia O’Keeffe’s famous Black Iris painting. It has become the motif of an event honouring Judy Chicago’s The Dinner Party. In 1979, artist and feminist Judy Chicago set the art world on fire when she unveiled The Dinner Party, a monumental multimedia tribute to women through history. Thirty-nine places were set around an imposing triangular table for women such as Sacajawea, Lewis and Clark's indigenous guide, and writer Virginia Woolf. A riot of feminist references, the piece is an evocative tribute to feminine creativity and pleasure – the surface of each dinner plate has a unique, sensual butterfly motif reminiscent of female genitalia. "It made an overwhelming claim for women's history, for women's wonderfulness, for women's right to a place at the center of life and art," art historian Frances Borzello wrote. Toronto chef Alexandra Feswick first encountered the work at the Brooklyn Museum. "It was overwhelming," she says, "I liked how the plate design became more sculptural as women's rights evolved." Following Ms. Chicago's lead, she's hosting a dinner at the Drake Commissary Sunday night and calling on the feminine imagination of Toronto chefs and artists to create an immersive dining experience. If Judy Chicago has set the table, then Alex Feswick is in charge of dinner. For many of the 29 female chefs participating, it's their first encounter with the iconic piece of feminist art. The introduction is one of the beautiful outcomes of the event. "I did not know about The Dinner Party before getting the call from Alex," says Jennifer Dewasha, executive chef of Toronto's Colette Grand Café. Some might have caught a glimpse of it in the Netflix hit Master of None. Touring the installation, Aziz Ansari's character, Dev Shah, turns to his female companion and asks, "Is it me or do all these [plates] look like vaginas?" Ms. Chicago's piece makes the point that it's because of their female anatomy that the women were pushed out of history. She adds another rich layer in creating the work from traditionally feminine art forms such as needlework and ceramic – often dismissed as low art. In treating feminine artistry as sacred, Ms. Chicago challenges the notion that high art emanates exclusively from men. That's a potent point of connection for female chefs whose skills and talents are often treated as less important than male chefs. Historically women's cooking has been hidden away in the private and mundane realm of the home. The barriers that prevent female chefs from entering the professional realm – strongly associated with masculine innovation – are substantial and still intact. International guides such as Michelin and the World's 50 Best Restaurants, the arbiters of haute cuisine, are frequently accused of barring the way for women. 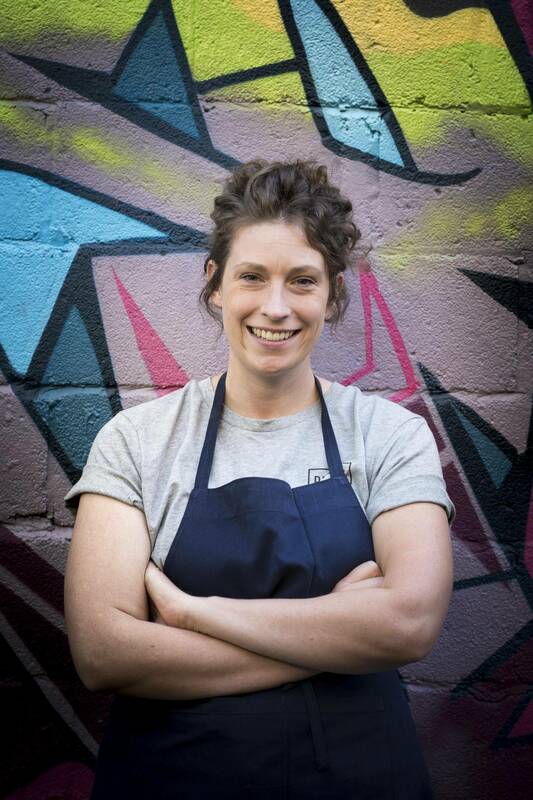 Chef Meghan Robbins of Toronto's Superpoint is working with a team to create one of three menus for the dinner. In one course, they're playfully recreating Chicago's butterfly motif using shucked oysters and juicy crushed grapefruit segments. "Some of our original ideas were toned down a little," she says, "Artists can push boundaries a little further, and we're consuming in a way that the art is not." "The idea that all of these women come together at a symbolic table is powerful," says the Drake's curator, Mia Nielsen. She's working with female artists to set the table for Sunday's dinner. Iris Moon, a collage by artist Jennifer Murphy, has become the event's motif. "I wanted to embrace all the women at Chicago's table and chose the first and last plate as my reference," she says, "The moon and lizard represent the Primordial Goddess, and the iris is a tribute to Georgia O'Keeffe's famous Black Iris painting." Sandra Brewster, Sojourner’s Stars, mixed media on glass, 2017. Artist Sandra Brewster chose the place setting for abolitionist and feminist Sojourner Truth, the lone black woman in The Dinner Party, as her inspiration. "I was interested in the representation of women of colour in the whole project," she says. Chicago's been criticized for her white, middle-class perspective. Brewster's using a quote about equality from Ms. Truth as a personal critique, printing it on fabric and using the star and moon imagery from it on candlesticks for the table. The Dinner Party raises the important question of why a separate table needs to be set for women. The rich details in Chicago's masterpiece demonstrate what's lost when feminine creative expression is stifled. She asks us to consider what's at stake when barriers are erected to keep women out and prevent them from fully participating in art and life. The point is not lost on Ms. Feswick as it relates to her creative life. "One day, at the end of the road, it would be nice for female chefs to lose the gender distinction."